Which Type of Head Line Do You Have? The head line commences from the space in between the Index finger and thumb and usually runs horizontally at least halfway across the palm. This line is one of the most significant on the palm because it reveals a great deal about the essence of you. It gives clues as to how we think and manage mentally. A head line that is tied, but narrowly separated at its commencement, suggests someone who is happiest when there are others around them whom they can relate to. Whilst they are confident, they may feel the need for support or sympathy from those people. If it is tied to the life line for more than a centimetre, makes the individual cautious and likely to take their time in becoming independent. The longer the join, the more insecure their ways. They tend to cling to the security of their family, home base and their own lifestyle. Their attitude, in general, is inhibited with a reluctance to make decisions. The shape of the hand and fingers should be taken into consideration. A sensitive water hand enhances the qualities, whereas an active fire hand balances them. A head line Where there is an apparent gap between these lines, the person is more adventurous and has an independent nature, and not necessarily connected by a bond to the family. They have learned to think for themselves at a young age, either by choice or by circumstance. If this gap is very wide, they can be impulsive or foolhardy. A straight line shows someone who is level-headed and set in their ways. They have a no-nonsense approach but can be inflexible and find it difficult to give and take. Imagination and creativity are commonly be lacking. Nonetheless, their mind can be very efficient for practical matters. If the line is also long and definite, attention to detail and accuracy are of importance to them, (the perfect line of an accountant). If it is short, they tend not to finish what they start. The straight line, if long and not tied to the life line at the outset, it shows someone who can speak their mind. They’re not shy but their feelings seem detached and due to their fearlessness, can fail to see the danger in situations. A long line displays someone with a broader range of analytical interests, a person who seems to have more intelligence, however, this is unfitting. The theory may have come about because of the attribute of attention for detail and no-nonsense approach to life that they have. The very long head line shows a deep, complex thinker, they tend to take more evidence into consideration before making decisions and are more philosophical than those with a short one. If this line runs entirely across the palm, it gives obsessive qualities. A short line is when it only reaches beneath the Saturn finger. It shows one who has more concerns about practical and routine matters preferring to concentrate on what is going on now without fussing over details; getting straight to the point. They do not like to waste time and so easily apply what they know through common sense and get their work done quickly. 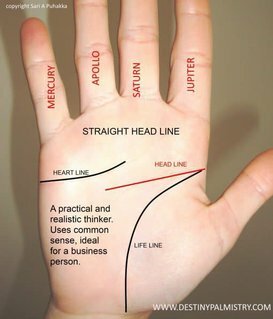 SEE ALL IN DESTINY PALMISTRY BASICS: WEAK LINES, SLOPING, DEEP SEATED, BROKEN, FORKED, BRANCHES, 11 DIFFERENT LINE MARKINGS. 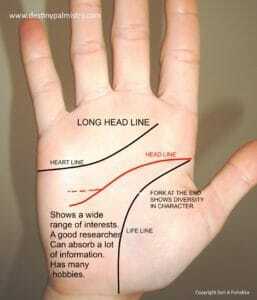 The major lines are often what people look at most when questioning about their palms. Some of these lines can and do change. What is evident in your hands now, does not mean that there is a fated outcome from what we see. As our thoughts and desires change, new lines can form and old ones can fade. The lines which are most likely to change are the minor lines. They tend to do so as our goals or motivations change. The major lines are least likely to change quickly over time. Palm ridges and fingerprints do not change. 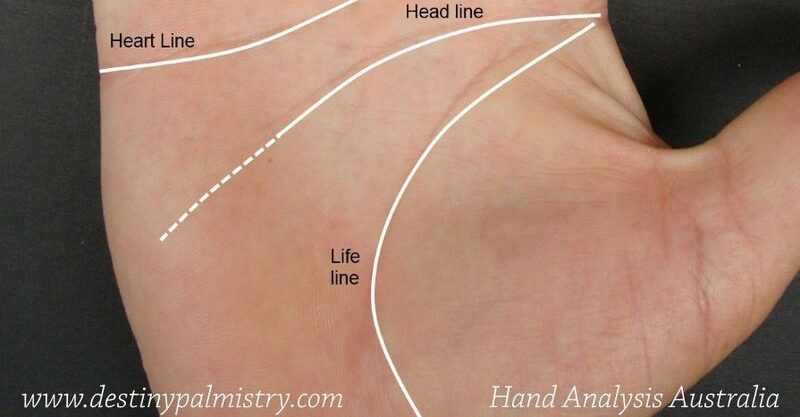 Palm reading lines meaning. Reading children lines. Would you like to learn hand analysis or have a personal reading by Sari? Click here to find out more. See how the elements in astrology affect your personality. Next PostNext Hand Reading Tips You Must Know!